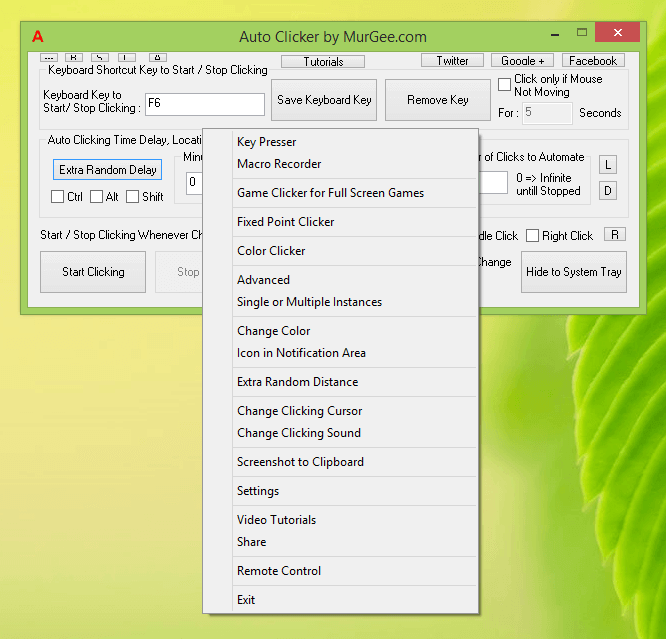 The Auto Clicker presented here is really easy to understand and use on your Windows Computer. Apart from Basic feature of Clicking Mouse repetitively, it can also assist you in doing automated advanced clicking. Yes clicking at a single location or clicking at random location around mouse cursor is easy to setup. The best part is you do not need any kind of tutorial or training to understand the Auto Clicker and all you need to do is have a look at the given below screenshot and that’s it. 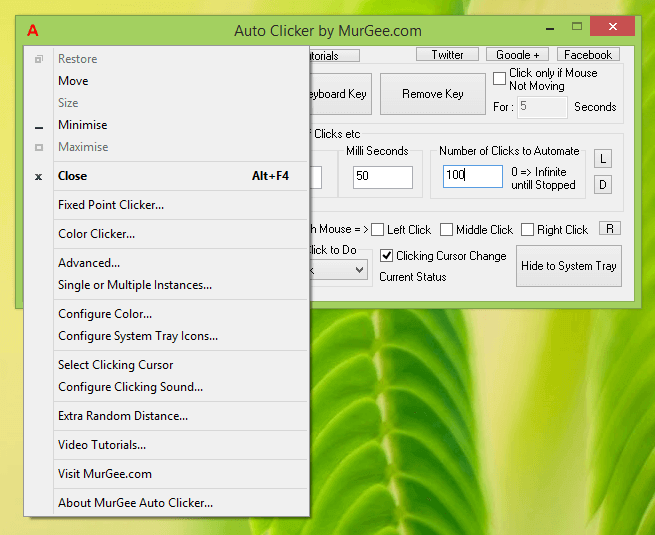 The Auto Clicker as configured above will click 100 times whenever you press function Key F6. Note that the time delay as configured is 50 Milli Seconds between consecutive automated mouse clicks done by the software. Yes you can change all the settings like Keyboard Shortcut Key to Start Clicking, Time Delay between Automated Click, Number of Clicks performed by the Auto Clicker and everything else you see in the screenshot above. Once you have understood the basic features of the software, you are ready to move ahead and quickly learn other features. On the other hand, if all you want is a Keyboard Shortcut to do Automated Clicking at current Mouse cursor position, you can just download and install it and use it. Yes Software Applications and Games now a days have become really involved and many time they need more than clicking at current Mouse Cursor Location. Taking into consideration, other requirements of a Gamer, the Auto Clicker has lots of advanced features which together can assist in almost any Game or Scenario which requires automated mouse clicking. Yes all these advanced features are really easy to understand and use. These advanced features range from clicking at a fixed or pre-defined screen location, allowing you to launch multiple instances of Auto Clicker, changing appearance of the software, change the mouse clicking cursor, changing mouse clicking sound and much more. The feature which makes the Auto Clicker easy to understand is the ability to view / utilize only the features you understand and need. Just as with any other Windows Application, you can right click on the main screen of the software to view the list of features which together assist you in doing 1 simple thing and that is Automated Mouse Clicking. Yes with little efforts, you can also use this Auto Clicker with your Mobile Phones and Tablets powered by Android, Windows Phone or even iOS. In case you would like to view all the features of the Auto Clicker without downloading and installing it, you can watch a Feature Tour Video of the software. You can go ahead and download the software for free on your Windows Computer, however once the free trial of the software expires, you would be prompted to pay software registration fees of $5.00 . When utilizing your free trial, do make sure that you do navigate through as many features as you can. Yes if you can Click and Right Click on a Windows Computer, learning and using Auto Clicker is really simple and straightforward. Mixture of Basic and Advanced features make the Auto Clicker, really the best software and yes there are tutorials for learning advanced features within the software. Learning Advanced or Basic features of Auto Clicker is really effortless as the Graphical User Interface of the Software has been designed taking into consideration that Novice and Advanced Gamers can quickly understand the software and concentrate on their Game instead of spending too much time and efforts on the Clicker.